A queue is a data structure that allows adding elements at one end of the queue, through Enqueue operations, and removing elements from the other end, through Dequeue operations. 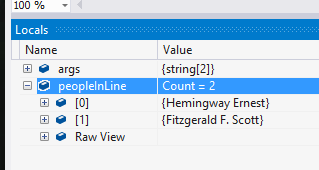 The .NET Framework includes a Queue<T> type, defined in System.Collections.Generic, that implements a queue data type. When you declare a queue, you indicate the type of objects that the queue will contain. You can now add instances of Person objects to the (back of) the queue using the Enqueue method. 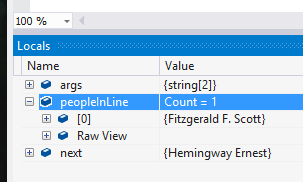 You can remove the object from the front of the queue using the Dequeue method.